At the outset, I never planned to review this book. I thought I would let it quietly pass by my blog as a (not so) little break from YA. But now I have finished it, and I am so overwhelmed with love and emotion that I just have to attempt to write my feelings into words. First of all thank you to my boyfriend Josh for recommending this book to me. I told him he could pick a book for me to read after I finished Cassandra Clare’s books, and he did not disappoint! We were just discussing East of Eden when I started to cry while trying to describe my feelings for it. I actually didn’t shed a tear while I read, despite the sheer emotion and even devastation I felt. It wasn’t until after, dwelling in these feelings, when it hit me completely. Josh asked me how I’d describe East of Eden and I said ‘a study of human emotion’. And I suppose, in short, that would be correct. If you read the synopsis for this book, you’ll probably wonder what kept everyone so entertained for 700+ pages. It’s literally a book about several generations of families in small town America in the 1800s. But it’s so much more than that. East of Eden is the rawest and most pure book I’ve ever read. Steinbeck writes with more honesty about human characteristics than I have ever read before – in an almost disturbing way. This is possibly the simplest – but most clever – thing Steinbeck could have done as an author. He opens characters to allow the reader to ponder the human mindset in a way they probably never have before. It made me realise the mixture of goodness and evil in everyone, the capabilities we all have as human beings to let ourselves be taken either way. And that despite our sins, we all feel weak, and we all feel regret. 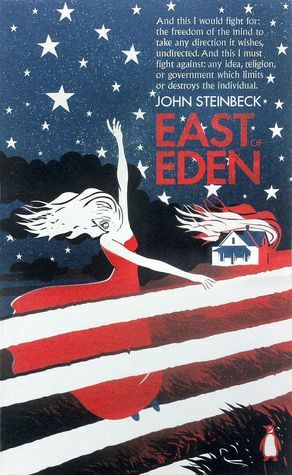 East of Eden has a pace all of it’s own. It is most definitely slow, but not boring..it is smooth. I know that I will come back to this book again and again because I drew such comfort from it’s pages. They flicker by in an almost inhuman calmness. It is sprawling, like a gentle ramble over hills on a gorgeous summers day. I wouldn’t want to receive this book in any other way. I have been left feeling fulfilled, overwhelmed and broken hearted. I cannot explain the importance of this book in words, and all that is left to say is please read it if you haven’t yet. It’s quickly become one of my favourite books of all time. I haven’t read this book but your review is already making me emotional. Aww I hope you enjoy it if you decide to read it!